Fusion upset Spitfire in a close five-game series. We were supposed to get a rematch of the Overwatch League stage one playoffs today, where London Spitfire bested New York Excelsior. But the Philadelphia Fusion didn’t get the memo. Fusion were heavy underdogs coming into their semifinal match against the London Spitfire. Their previous two meetings in the regular season saw Spitfire sweep Fusion off the stage. Their meeting earlier in stage two was a disaster for a Fusion team that looked on the rise at the time. But today, Fusion made the necessary adjustments and played like the better team, ending Spitfire’s hopes at reprising their championship run in a close 3-2 series. The key to victory proved to be patience. Spitfire abused Philly’s aggressive dive in their previous meetings, but today, Fusion played more measured in approach, keeping their tanks alive longer and attacking at more opportune moments. Overly aggressive main tank Joona “Fragi” Laine still had his moments, dying early in a couple of pushes, but overall he played a much more effective game. Zenyatta player Isaac “Boombox” Charles also had a standout series. Yesterday we saw Park “Profit” Joon Yeong’s solo Tracer play absolutely abuse Dallas Fuel’s Zenyatta, but Boombox got the better of Profit enough times to keep Philadelphia in the game. Fusion also benefit from their deep roster. They fielded Josue “Eqo” Corona as DPS over Georgii “ShaDowBurn” Gushcha in the first four games, and Eqo’s nose for racking up final blows and flexibility were key to Fusion’s success. Then, in game five, Fusion benefited from the Tracer play of Simon “Snillo” Ekström, who missed most of stage one due to his young age. This was supposed to be a nightmare matchup for the Philadelphia Fusion. Not only did Spitfire handle them easily in their past meetings, but the map list also favored Spitfire: They were undefeated on Hanamura and Route 66 entering the series. And the match started looking like Spitfire would continue their dominance. Gibraltar wasn’t even close. Fusion opened on offense but couldn’t even take the first checkpoint. That result confirmed the uneasy feelings spectators felt watching the game: This would be another blowout. But Fusion didn’t let the result attack their confidence. They opened Nepal fast, taking over the control point and playing their new patient dive, forcing Spitfire into awkward positions before pouncing. Then came Hanamura, a map that the Spitfire never lost all season with a 5-0 record. The two teams played it when they met earlier in stage two, and Spitfire dominated it with counter-dive play that took advantage of the aggression of Philly’s tanks. But this time, the Fusion were more measured in their approach, and it paid huge dividends. They finished the map in overtime, but their real strength was on defense, where they prevented Spitfire from taking a single point by pulling a page out of London’s book—a last-second contest turning into the fight that won the map. That gave Philly a 2-1 lead heading into their best map on paper: King’s Row. It looked like Fusion might end the series in short order with a punishing attack. Their triple tank Hanzo composition caught Spitfire off guard, running the payload through the map with over two and a half minutes left in the time bank. But Spitfire wouldn’t be outdone, opening with their own three tank composition and matching Philly’s aggression. They finished King’s Row even faster before shutting down Philly’s time bank attack. The match came down to Route 66, and Fusion had a secret weapon: Simon “Snillo” Ekström, the young Tracer specialist who only recently became old enough to compete in the league. Snillo subbed in for Eqo, allowing Lee “Carpe” Jae Hyeok to play Widowmaker exclusively, but Fusion’s attack was really the Snillo show. He finished with 24 elimination, 14 final blows, and just one death as Fusion pushed the payload through the map to finish with a 1:23 time bank. 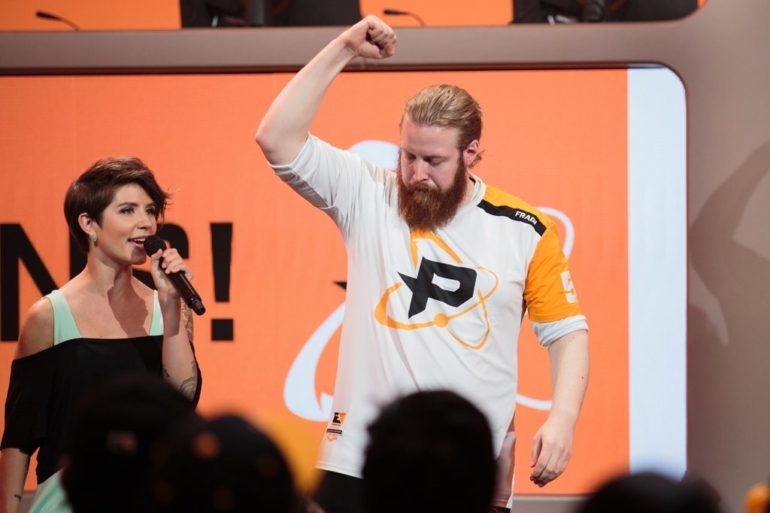 Snillo’s defensive round wasn’t as dominant, but Carpe picked up the slack, providing the key Widowmaker picks Philly needed to stave off Spitfire’s attack. Overall, it was an incredibly impressive showing from a Fusion team few thought would beat Spitfire. They showed they can make the necessary adjustments to challenge for the league title, and now they’ll have a shot to at least take the stage two championship against the New York Excelsior later today.